AWSOME!! Every time I see YES, I keep wondering if it'll be the last time. I hope not, but if it is, what a swansong! As far as I could tell, everyone was on blistering form and it was great to hear Mind Drive at last. Here's to another 5 (10?) years of great albums & great gigs (if they manage 10 years, Jon'll be 70!) Gaun yersel's lads! This year marks the 35th anniversary of one of the most influential bands in the history of popular music: Yes are embarking on a tour to mark the occasion, with performances that span their career and unique stage designs by long-time visual collaborator Roger Dean. 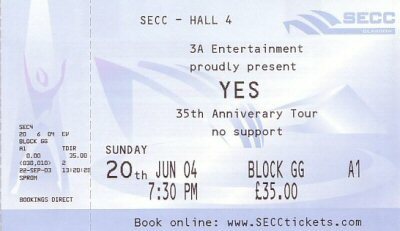 Tickets for 20 June 2004 at SECC are �35.00 (added 25/07/2003). 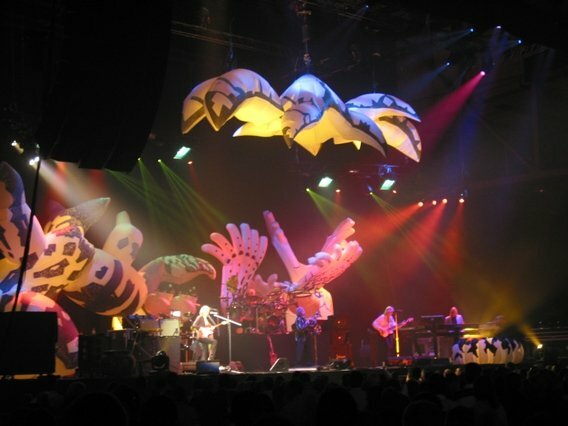 "Unique stage designed by long-time visual collaborator Roger Dean." It�s so wonderful to be here tonight. Thanks for coming out. We appreciate it so much. Thank you! Thank you so much. Thank you. Thank you so much. Most every day, every day, you create your own world. You create everything, as a top off, we do. We create everything, in the mind, the drive inside, to make things work for a better life for ourselves first, and everyone around us. In the �Mind Drive�, The feeling of the �Mind Drive�. Thank you. Thank you for listening. Thank you. Thanks for listening. Thank you so much. That comes from an album that we made in 1996, around that time. Yeehah! We�re going to, ahh do one more song and then we're going to go and have a cup of tea, with some biscuits and stuff. I�ve got some Roker�s ahh, chocolate chip cookies backstage. And weeheeeh! I�m sorry. After the count of five, I think. Yes! Wooh! Thank you so much. This next one�s for Alan�s kilt. No, mon, no. That�s because he�s not wearing anything underneath. We want to know, don�t we? Don�t we? This one�s for Alan�s lovely Mum, who is here tonight. Thank you, Mum. Wooh! Thank you so much. A couple of years ago, we did an album and ahh, we wrote a song, a very simple song and ahh, looking at the lyrics realizing that ahh, we get together so many times, over and over the years, that time has saved us to be together once more. So, this song is a homage to the fans. Here we go. With an introduction, an introduction with a paradiddle, a paradiddle in the middle of the introduction from Alan. Thank you so much. Thank you so much. And ahh, yeah, exactly. I was just going to say that, as well! Where�s Chris? Chris is going to have a quick chat with you. You know, I love being in Scotland, I really do. And, it brings me up to a story, ahh, about Scotland. Ahh, back in the seventies, when we were touring around here ahh, we, we put together an album ahh, called �Fragile� and one of the tracks from that is ahh, Rick! Yeah, I�m going to get him a curry in a minute. And one of the tracks on that album, as you all know, is �Roundabout�. And ahh, when Jon wrote the lyrics to that song, we were actually driving around on a little tour of Scotland at the time, so really we owe the lyrics to that song to you guys. Yeah, lots of roundabouts. So anyway, when we were doing the acoustic, added disc for the ahh, �Ultimate Yes� album, um, we, Alan and I were discussing um, how we could do it, sitting around in our hotel in Tokyo and um, what happened then? [??]. We were sitting around in our hotel in Tokyo, nowhere near a massage parlour, and um, we were just, Alan suggested we do a shuffle, a kind of a Chicago blues ahh, version of it. So when we got to the studio in L.A. I said to Rick, can you give us a real good piano, Chicago blues version of �Roundabout�, and he went (Rick plays). And we went, yeah, that�ll work, that�s brilliant! This one�s for Scotland. Wooh! This one�s for my beautiful, wonderful wife, who is with me all the time, on our wonderful journey. And ahh, we walked around George, George Square today. It was kind of cool, just walking around Glasgow, probably for the first time, just wandering around for an hour. It�s just great to be here. Thank you so much. Thank you so much. Ahh, actually, for the first time, I�ve been to Glasgow so many times, and my Dad was born here, in Paisley. So ahh, yes! I�ll bless him. So, this is a song for him. With a great introduction from Alan, with a paradiddle in the middle, and at the end. Here it comes. Thank you. Thank you. While we put things away, [?? ], Steve Howe�s going to play for you a little bit. Here we go. Thank you very much. It�s nice to be back in Glasgow. It�s nice to be here. Thanks. Thanks for coming down the [??] too. Wooh! Thank you so much, thank you. One of the great things, to be able to get together again. After so many years, to be able to play this next piece of music, which we enjoy playing. No matter where we are, we just love to play this. We want to thank you again for being with us tonight, really wonderful. Thank you. The amazing power of you listening, very powerful. Very ancient, very ancient. A ritual of life, a ritual of music, a ritual of love. Love is everything! Love is everything! Everything, love is everything! The ritual, �Ritual�. Thank you all for coming out tonight and making it such a great night for us. We appreciate it so much. Just one more time, just one more time. Thank you so much.